GESAB takes part in the command center of Mecca. The Saudi General Director of Civil Defence, Saad bin Abdullah Al-Tuwaijri, recently inaugurated the Mecca wireless communications control room. This is a facility that ensures the safety of hundreds of thousands of Muslim pilgrims who flock every year to the holy city. 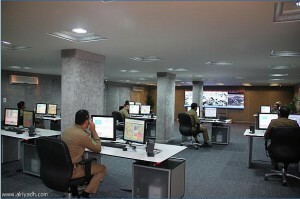 From the control room of Mecca operatos coordinate all police and civil protection teams, in addition to instantly monitor all security cameras located in strategic places. Mecca is a city in the Hejaz and the capital of Makkah province in Saudi Arabia. The city is located 70 km (43 mi) inland from Jeddah in a narrow valley at a height of 277 m (909 ft) above sea level. Its resident population in 2012 was 2 million, although visitors more than triple this number every year during Hajj period held in the twelfth Muslim lunar month of Dhu al-Hijjah. As the birthplace of Muhammad and a site of the composition of the Quran, Mecca is regarded as the holiest city in the religion of Islam and a pilgrimage to it known as the Hajj is obligatory for all able Muslims. The Hijaz was long ruled by Muhammads descendants, the sharifs, either as independent rulers or as vassals to larger empires. It was absorbed into Saudi Arabia in 1925. In its modern period, Mecca has seen tremendous expansion in size and infrastructure. Because of this, Mecca has lost many thousand-year-old buildings and archaeological sites. Today, more than 15 million Muslims visit Mecca annually, including several million during the few days of the Hajj. As a result, Mecca has become one of the most cosmopolitan and diverse cities in the Muslim world, although non-Muslims remain prohibited from entering the city. Mecca is the familiar form of the English transliteration for the Arabic name of the city, and the word has additionally come to be used to refer to any place that draws large numbers of people. The strictly correct English transliteration is Makkah. The spelling of the name in English was officially changed to this form by the Saudi government in the 1980s, but is not universally known or used worldwide. The full official name is Makkat al-Mukarramah (??? ?????? ?, pronounced [makka lmukarrama] or [makkat almukarrama]), which means Mecca the Honored, but is also loosely translated as The Holy City of Mecca. The ancient or early name for the site of Mecca is Bakkah (also transliterated Baca, Baka, Bakah, Bakka, Becca, Bekka, etc. ).An Arabic language word, its etymology, like that of Mecca, is obscure. Widely believed to be a synonym for Mecca, it is said to be more specifically the early name for the valley located therein, while Muslim scholars generally use it to refer to the sacred area of the city that immediately surrounds and includes the Kaaba. Another name for Mecca, or the wilderness and mountains surrounding it, according to Arab and Islamic tradition, is Faran or Pharan, referring to the Desert of Paran mentioned in the Old Testament. Arab and Islamic tradition holds that the wilderness of Paran, broadly speaking, is the Hijaz and the site where Ishmael settled was Mecca. Yaqut al-Hamawi, the 12th century Syrian geographer, writes that Faran is an arabized Hebrew word. One of the names of Mecca mentioned in the Torah. There is a Tal Faran (Hill of Faran) on the outskirts of Mecca.